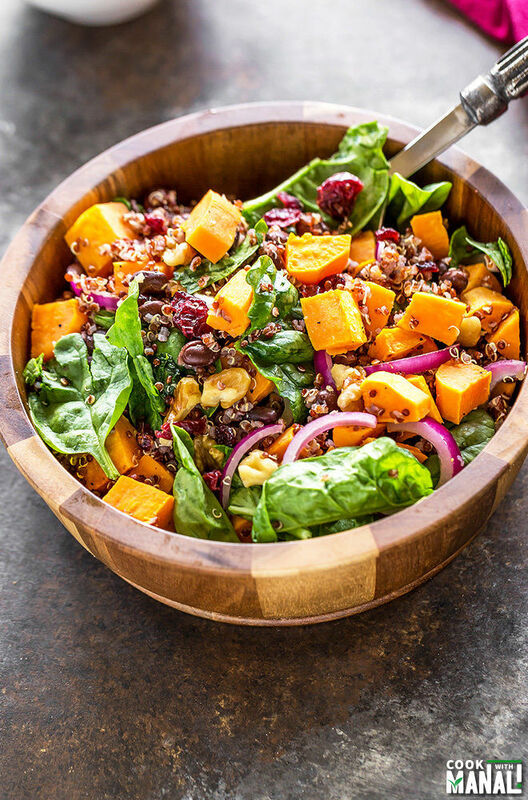 Roasted Sweet Potato Quinoa Salad with black beans, spinach, red onion, walnuts and dried cranberries. 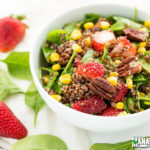 This vegan and gluten-free salad is not only nutritious but also perfect for the season! So this weekend was Diwali and I was super busy with house cleaning. Diwali is only time of the year when you do deep cleaning like empty all drawers, re-arrange your closet – you know that kind of cleaning. Yes that kind of cleaning can only happen during Diwali and thank god for that because that way you get rid of so much clutter. I really don’t understand how we accumulate so much unwanted stuff in the house with in months. Its unbelievable! Cleaning my house this weekend I realized one thing – a lot of clutter in the house is because of my food blog. Over the last 3 years, I have bought so many props, cutlery, napkins etc etc. that it’s literally everywhere. And the funny part is that I use only 20% of everything that I have. The remaining 80% I haven’t used even once in the last 2 years. The reason is that I bought a lot of stuff when I didn’t know anything about food photography [what was I thinking!] so it’s all a waste now. Agreed it’s not easy to throw away practically new stuff but honestly I had to get rid of all that stuff and I am glad I did. My drawers and my house definitely feel lighter after throwing away so much! Other than cleaning, there was of course lot of food. I had so many sweets that it has got to the point where I don’t want to hear about sweets anymore! Well I know this feeling won’t last for more than 2 days, in fact I would be surprised if this lasts till end of the day today but right now I will take it. 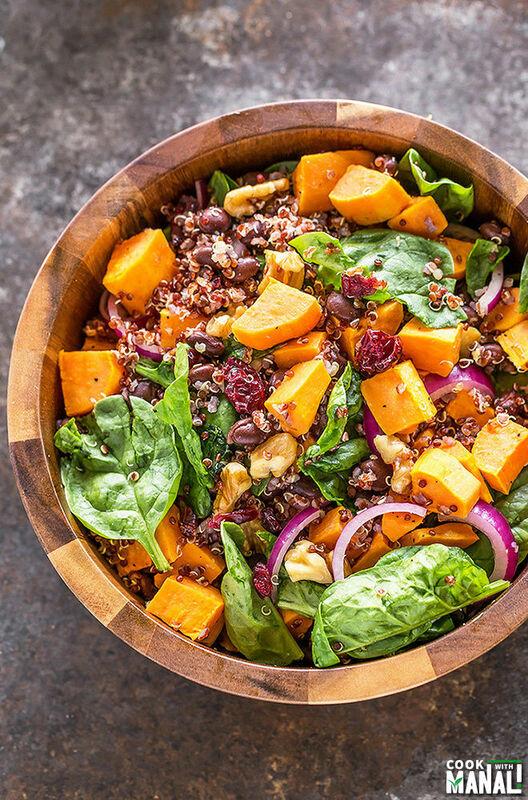 And right now all I want to eat is salads like this Sweet Potato Quinoa Salad. 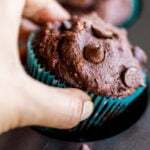 ✔ Sweet Potato: of course my absolute favorite! I really can eat sweet potato everyday and not get bored of it and roasting it is the best way to eat it. 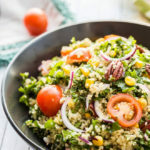 ✔ Quinoa: I don’t eat as much quinoa as I would want to but mixing it in a salad is probably my favorite way to eat it. ✔ Cranberries & walnuts: cranberries add little tartness to the salad and walnuts the required crunch to this salad. 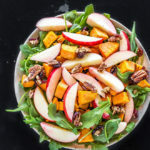 This salad is not only but also perfect for the season! Thanksgiving will be soon upon us and that is an excellent salad for the holidays. It’s doesn’t take much time to make this salad, it’s vegan, gluten-free and quite filling on it’s own. 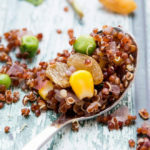 In fact all quinoa based salad are not only nutritious but also very filling and which is why I love them so much! 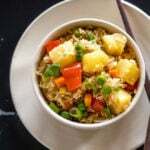 Hope you guys enjoy this Sweet Potato Quinoa Salad! * I personally love this salad when it’s cold so I chill it in the referiegrator before serving. Of course that’s a personal preference, you may serve it immesdiately as well. 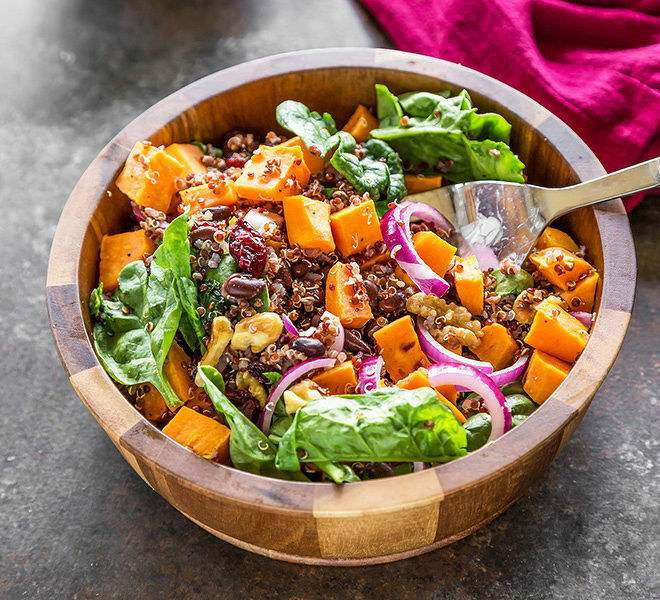 Vegan and gluten-free Sweet Potato Quinoa Salad with black beans, walnuts and dried cranberries! Preheat oven to 425 F degrees. 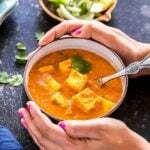 Toss sweet potato cubes with 1 teaspoon oil, salt and pepper. Transfer to a baking sheet and roast at 425 F degrees for 15 minutes or till sweet potatoes are fork tender. Remove from oven and transfer to a large bowl. Add black beans, cooked quinoa, sliced onion, baby spinach, walnuts and dried cranberries. Mix everything together. Set aside. In a bowl or jar, whisk together all the dressing ingredients - olive oil, rice vinegar, maple syrup, lime juice, salt and pepper. Chill the salad before serving. This sounds like an incredible salad! I’m a huge fan of roasted sweet potatoes, so I know this would be a hit around here. Hope you had a great weekend, my friend! Happy Halloween! Sweet potatoes make everything better! I could eat this everyday! Have a great day, my friend! What a pretty salad! I have a feeling this would quickly become a favorite of mine. Love the seasonal touch with sweet potatoes! Love deep cleaning my house, but don’t have the time to do it 🙂 Hopefully when my parents are here around the holidays 🙂 Happy Diwali! This salad looks gorgeous! Pinning! This salad is gorgeous, Manali! Love all the vibrant colours – so beautiful. 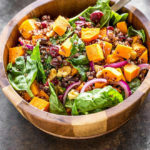 I really love sweet potato and quinoa, so I know this salad recipe would be perfect for me to try! Wow. I really like the way you paired cranberries and walnuts with quinoa! There are a lot of great flavors going on here! What a delicious Autumn salad, Manali! Love all the gorgeous colors too! It’s crazy how much stuff we clutter up our lives with! I’m so glad you took the time to clear yours out and I should do the same! 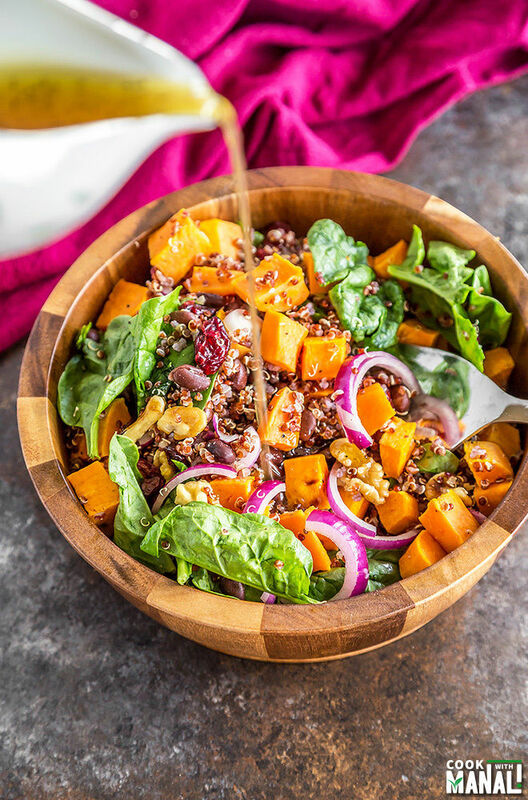 That sweet potato quinoa salad is so bright and pretty! Cleaning – no fun. 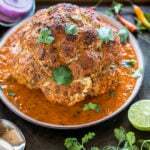 Food – lots of fun. 😉 Ha ha!! This salad looks perfect, Manali. I know I’ll be trying it this fall! haha I agree! Thanks Megan!